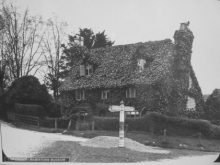 It was put up for auction along with many other properties in the village in 1911 by the FitzHerbert’s, the then owners of the Smiths Hall Estate by which time it was called Ivy Cottage. It is obvious from the photo why! It also appears that the road was not metalled, and no doubt got very muddy in winter. A copy of the Auction catalogue exists and the entry for “Ivy Cottage” is below. 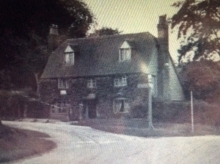 It states that the house is attached to West Farleigh Post Office, but it is more likely that the front room of the house were used for the Post Office. Mr H Wilding was the tenant and probably the Postmaster. While it was still the Post Office the ivy was cleared away. You can imagine the house breathing a sigh of a relief as the strangled hold of ivy was removed. There is now a sign on the wall, probably saying Post Office. Cart wheel tracks can be seen on the road. Was the road covered in crushed stone? 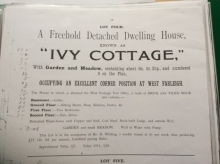 There is a hand written note on the catalogue indicating that Thomas Dove bought Ivy Cottage and 2 cottages on the Green. These are probably the two cottages that have been turned into Rose Cottage. Thomas Dove was living in one of these cottages at the time of the sale. It is interesting as these two cottages later became the village shop and post office. Or was the village shop already there? Roly Philpott who had lived in the village all his life, was sure that it was called Dove’s Cottage because it belonged to the Dove family. This looks as if it could be right. 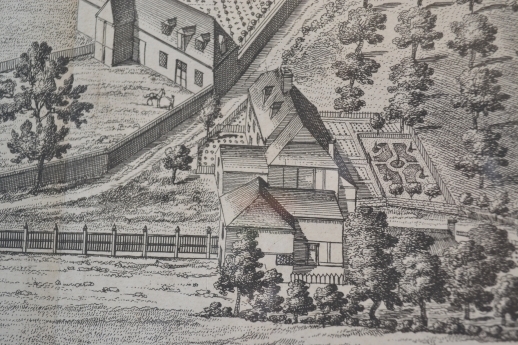 The Dove family were living at West Farleigh Green in 1841. As there were not many houses on the Green at that time, they must have lived in the weatherboarded cottages, which were demolished and replaced by Rookery Row or one of the pair of old houses, now 1 and 2 The Green or one of the two cottages that are now Rose Cottage.. In the 1841 census, Robert Dove head of the family, was listed as being a shoemaker, living with his wife Elizabeth and his children, including Thomas. By 1851 his eldest son, also Robert was married to Caroline, living at Farleigh Green and working as a gardener. There were Doves living on the Green as late as 1911. Bob and Clare Gilbert who currently live in Dove Cottage were happy to have the history of their house posted on the website! It has changed again from Dove’s Cottage to Dove Cottage. If you have any further information or can correct the story, which has been pieced together from various sources, we would be pleased if you could let us know.